Tag Archive | "Bay Leaf Used Books"
Johnathan Rand was a big hit at Bay Leaf Books Tuesday. 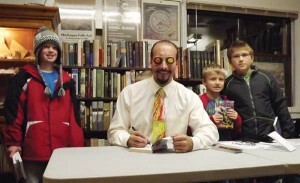 Johnathan Rand, author of the tremendously popular Michigan Chillers, American Chillers and Freddy Fernortner series of children’s books, had kids waiting in line to see him Tuesday night at Bay Leaf Used Books, in Sand Lake, Tuesday. The line was out the door and down the sidewalk, as kids waited to buy books and get them signed. Rand’s Chiller series has a massive fan base across the country, but he is especially popular in his home state of Michigan. Rand is on tour to promote the importance of reading for kids, who find titles like Gruesome Ghouls of Grand Rapids and Mackinaw City Mummies hard to resist. Author Johnathan Rand will be at Bay Leaf Used Books in Sand Lake next Tuesday. 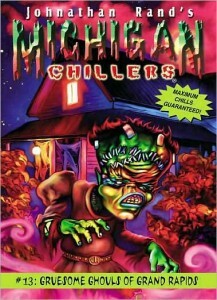 Johnathan Rand, author of the tremendously popular Michigan Chillers, American Chillers and Freddy Fernortner series of children’s books, will be doing a book signing at Bay Leaf Used Books, in Sand Lake, on Tuesday, December 6, from 6 to 8 p.m. Fans can bring their own book for Mr. Rand to sign or purchase a copy at the store. Rand’s Michigan Chillers and American Chillers series are targeted at third to fifth graders, while Freddy Fernortner: Fearless First Grader is popular with first to third graders. For more information on Johnathan Rand, please visit http://americanchillers.com/. Bay Leaf Used Books is located at 49 E Lake in downtown Sand Lake, one block west of Northland Drive. They can be reached at (616) 636-8500. You can also visit them online at www.bayleafbooks.com.